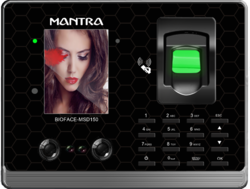 We are a leading Manufacturer of face recognition time attendance system, mantra bioface time attendance machine, mantra face recognition time attendance machine and mantra face recognition system from Ahmedabad, India. We are engaged in offering Mantra Face Recognition Attendance Machine. MSD1K is low cost Facial recognition terminal with multimode biometrics technology. Multi identification validation methods by RFID card, Fingerprint and Face capture combination. The 2.8 inch TFT high-definition color display with elegantfeel. The MSD1K has TCP/IP communication,P2P network real-time communication, realize transport data with WIFI. Contactless Face capture attendance, easy to adjust. High recognition ability for face capture image even wears glasses, the identification time is less than 0.8 second. It is possible to integrate all kind of applications like ERP, HRMS, Payroll, Attendance and SAP with the device. We are offering Mantra BioFace Time Attendance Machine to our client. We are offering Face Recognition Time Attendance Machine to our clients. 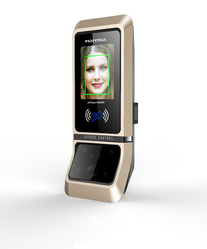 We are offering Mantra Face Recognition System to our client.